Donald Trump today blasted his critics for complaining that he is tending to business matters rather than his presidential campaign, arguing that Hillary Clinton takes time off the trail for less important matters. "I built one of the great hotels of the world. What am I supposed to do, not show up? I'm taking one hour off. I'm going to North Carolina right after this, then I'm going back down to Florida. I'm going up to New Hampshire. 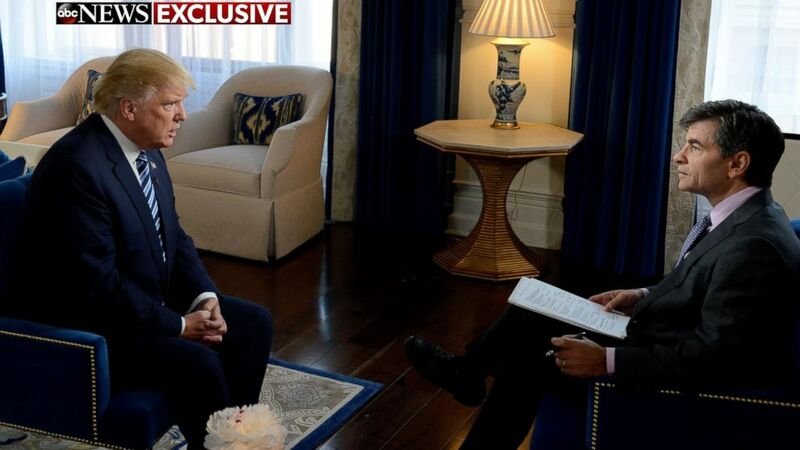 I'm all over the place," Trump said in an exclusive interview with ABC News' George Stephanopoulos from inside his new Washington, D.C., hotel. "I can't take one hour off to cut a ribbon at a one of the great hotels of the world? I mean, I think I'm entitled to it." The Republican presidential candidate blasted Clinton for taking Tuesday night off to go to an Adele concert. "I think it's so unfair because, you know, Hillary Clinton goes to see an Adele concert last night, and everybody says, 'Oh, wasn't that nice, isn't that wonderful?'" Trump said. "She goes, she does one stop," Trump told ABC News today, which is Clinton's 69th birthday. "She has no energy. She's got nothing going. She does one stop. And nobody complains about that. Nobody complains when she goes to an Adele concert all night long, while I'm making two speeches at rallies with, you know, massive crowds." Trump has repeatedly criticized what he calls Clinton's lack of stamina, citing her decision to take five days off the campaign trail before the last of their three presidential debates. She has argued that the preparation last week for her final major national audience before Election Day was time well spent. Trump spent the morning in Washington to attend the grand opening of his brand's latest hotel. The hotel, which is in the city's Old Post Office building, had a soft launch last month. That "I built this hotel under budget and ahead of schedule ... sends a real message," he said. But the hotel hasn't been without controversy. Famed chef Jose Andres had been set to run one of the hotel's restaurants, but he backed out of the project after Trump said last year that some Mexicans entering the U.S. are "bringing drugs, they're bringing crime, they're rapists."